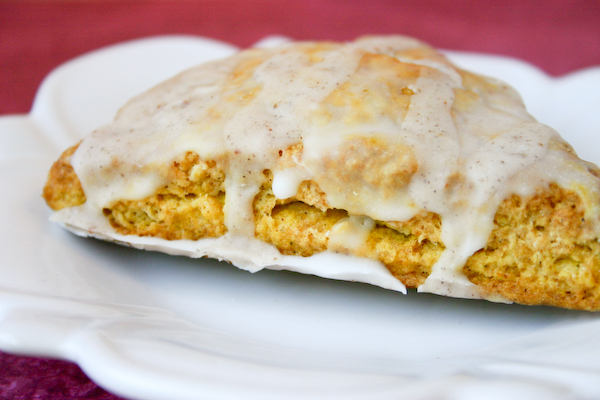 Homepage / Breakfast / Pumpkin Spice Scones. 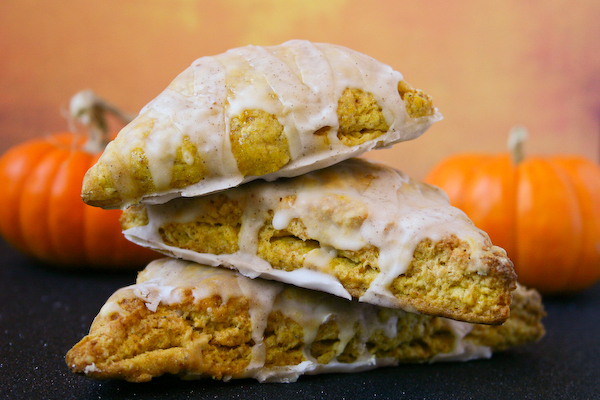 And October = pumpkin spice scones! 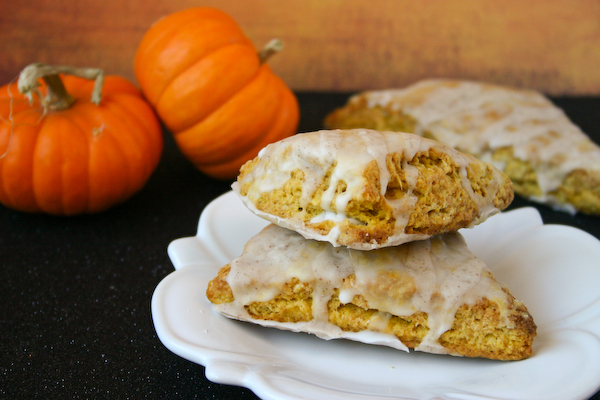 another fall recipe that I wanted to make last year, but didn’t because, well, let’s face it, these scones are just a fancy excuse for eating giant, cakey pumpkin spice cookie-wedges covered in cinnamon-sugar glazes for breakfast. Sometimes figuring out what to bake around here can be a headache. I don’t like crispy cookies, my parents do. They like nuts in their cookies and pancakes… do not even get me started. My dad doesn’t like mint or lemon, my mom doesn’t like cinnamon with chocolate or anything sweet with peanut butter. My boyfriend doesn’t like mini M&Ms, sweet things for breakfast, burnt marshmallow s’mores, or sugary frostings. Frosting! Honestly, what am I getting into here? It’s a good thing we’re in love and all that. Luckily everyone loved these and they disappeared fast. Like… within 48 hours. And as someone maybe slightly obsessed with the Starbucks version, I have to say these were pretty close… and maybe even slightly better. 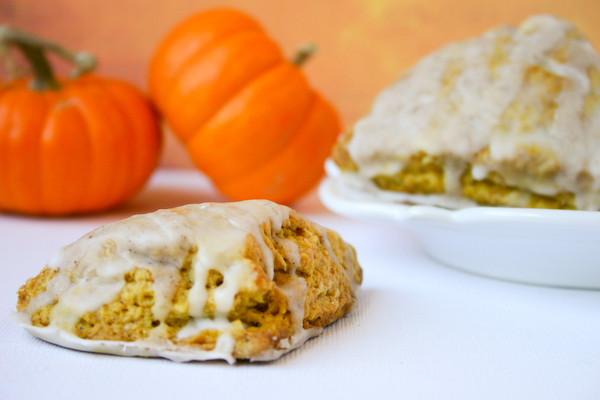 I think next time I would add a little more cinnamon to the scones and make the glazes a little bit thicker, but other than that, these were perfect. And I kind of wish there were some left. P.S. 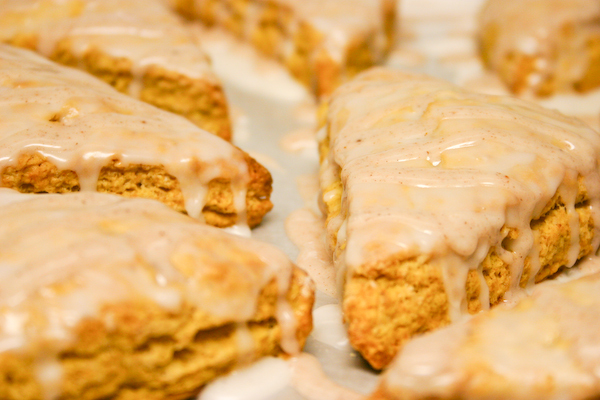 I highly recommend putting your fresh-baked scones on a baking sheet lined with wax paper, drizzling the two glazes over the top, and then moving them to a fancy plate… all so you can scoop up that extra cinnamon-sugar glaze with a spoon. I did not do that. Okay, fine. Totally guilty. Look at you, knowing me and all. 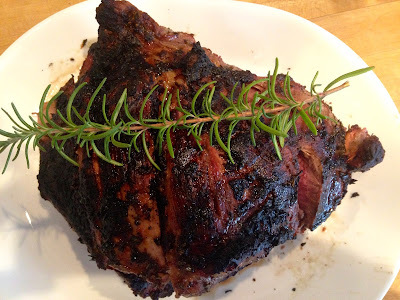 Preheat oven to 425°F. Spray two baking sheets with nonstick spray or line with parchment paper and set aside. In a large bowl, sift together the flour, sugar, baking powder, salt, cinnamon, nutmeg, cloves, and ginger. Add the cubed butter on top. Cut together using a fork or pastry blender until it reaches the consistency of coarse cornmeal (pieces of butter should be no larger than a small pea). Gradually fold the pumpkin mixture into the flour mixture, using a spatula, wooden spoon, or your hands. Make sure all the dry ingredients have been moistened well. Using a sharp knife or pizza cutter, divide the rectangle into three equal pieces, then cut each piece into four smaller triangles by making an “X” through them. 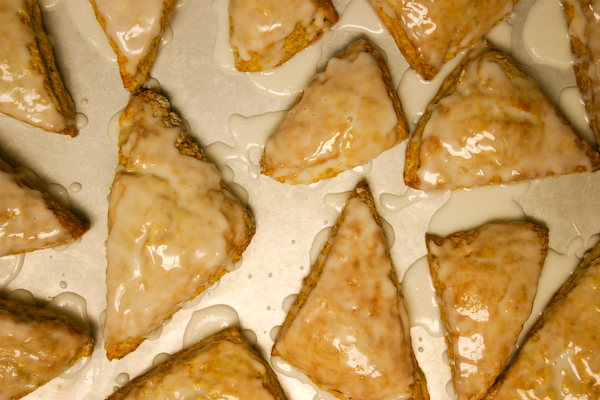 Place scones on baking sheet and bake for 13-15 minutes, or until just light brown. Remove to cooling rack and let cool before icing. Let icing set (or not) and enjoy! Previous post Thanksgiving Moments & Apple Butter Pumpkin Pie. 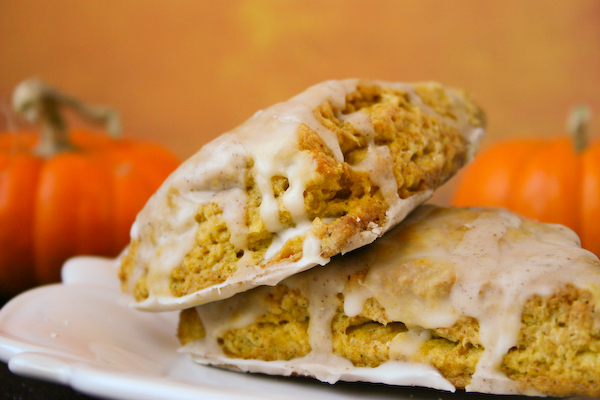 Next post Pumpkin Spice Cupcakes for Two.